1Corporación Colombiana de Investigación Agropecuaria, CORPOICA. Palmira, Valle-Colombia. 59 accessions of the American oil palm, also known as Nolí palm, were characterized in the Research center El Mira of Corpoica -Colombia. Based on 13 qualitative descriptors, in order to identify genotypes with desired traits for use in the breeding program. The multiple correspondence analyses allowed to identify five factors which express 100 % of the collection variability. The affinity hierarchical classification identified four groups by descriptors action: form of reproduction, unripening fruit bunch color, ripening fruit bunch color, fiber percentage in the bunch and bunch exhibition percentage. 97.3 % of the palms, performs a prostrated stem, 100 % of total population, performs inserted leaflets in single plane. In the palm collection work, the color of unripe fruit bunch type green, represents the 4.5% of the population, 5.3% of the palms are prolific type and 6.4% performs a hermaphrodite flowering stage. No androgynous palm inflorescence were recorded. 87% of the palm collection have allowed to establish inflorescence with 25% of enclosure fibers, which represents 75% bunch exposure. These two traits, allows cross-pollination and valorization of E. oleífera genetic resources which will be essential for the development of American oil palm cultivation and plant breeding of the species. En el Centro de investigación El Mira de Corpoica, se caracterizaron 59 accesiones de palma americana de aceite, también llamada palma Nolí; de la colección de trabajo, con base en 13 descriptores cualitativos. El análisis multivariado por correspondencias múltiples identificó cinco factores que expresan el 100% de la variabilidad de la colección. La clasificación jerárquica por afinidad identificó cuatro grupos por acción de los descriptores: forma de reproducción como se obtuvieron las accesiones, color del fruto inmaduro, color del fruto maduro, porcentaje de fibra en el racimo y porcentaje de exposición del racimo. El 96,9% de las palmas presentan tallo postrado, el 100% presentan hojas con los foliolos insertados en un solo plano. En la colección se encontró que el color de fruto inmaduro tipo verde representa el 3,7% de la población; el 5,2% de las palmas son del tipo prolífico y el 6,3% poseen floración hermafrodita. No se encontraron palmas con floración andrógina. El 72% de las palmas de la colección emiten inflorescencias con 25% de fibras envolventes, lo cual representa un 75% de exposición del racimo; estas dos características facilitan, la polinización natural La utilización y puesta en valor de los recursos genéticos de E. oleifera será esencial para el desarrollo del cultivo de palma Americana de aceite y el mejoramiento genético de la especie. The genetic diversity of plant species is being threatened by habitat loss, global warming, overexploitation and population growth. These factors are constantly increasing. The conservation of plant genetic resources takes importance worldwide and remains a concern to keep the highest number of species conserved not only in its origin center, but also in those places where their use has economic importance or economic potential (Sevilla, 2006). Therefore, the proper characterization of cross - pollination populations and ex situ collections, have allowed to identify interest traits to plant breeding and important tools which will optimize conservation and identification of valuable American oil palm genotypes. Globally, there are about 2600 species of palms, distributed in tropical and subtropical ecosystems. These are one of the most important non-timber forest resources used for housing construction, tool making, craft production, as a food source and the production of edible oils. In addition, these species are distributed from sea level up to 3000 m. a. s. l. (Dransfield, Uhl, Asmussen, Baker, Harley, & Lewis, 2008). The Nolí palm belongs to Arecaceae family, is a native plant from South America and Central America. In Colombia, it is scattered on the north coast (Valley of Sinu), throughout the Magdalena river region, from San Alberto (César) to Lérida (Tolima) (Ooi, Da Silva, Müller, & Nascimento, 1981; Seng 1983; Dransfield et al., 2005). The scientific interest of the E. oleifera species, is due to its economic importance, the high content of unsaturated fatty acids (oleic> 60%, and linoleic acid> 18%), low rate of stem growth and tolerance to some limiting diseases in the cultivation of American oil palm. For example, bud rot and vascular wilt caused by Fusarium oxysporum (Miranda, Rabelo, Bueno, Barbosa, & Ribeiro, 2001; Barcelos, Amblard, Berthaud, & Seguin, 2002), the ability to transmit their traits and produce inter-specific hybridization which is being followed in oil palm for introgression of various traits with the two species (Moretzsohn et al., 2002; Alvarado & Sterling, 2004; Rey, Gómez, Ayala, Delgado, & Rocha, 2004; Zaki, Ismail, Rosli, Chin, & Singh, 2010; Barcelos, Rios, & de A-Cunha, 2015). The aim of this research was to characterize 59 accessions from the Nolí palm of the Corporación Colombiana de Investigación Agropecuaria- Corpoica, collection work with thirteen (13) descriptors, in order to identify genotypes or group of genotypes with desired traits for use in American oil palm breeding program. The research was carried out at the "El Mira", Corporación Colombiana de Investigación Agropecuaria- Corpoica, located in Tumaco -Nariño, Colombia, at 16 m. a. s. l., the area is characterized by bimodal rainfall regime. The Nolí palm work collection was planted in 1977, consists of 59 accessions generated among selected palms in Valle del Sinu, Cereté, Córdoba, of which 11 were obtained by autopollination, 10 are open pollinated and 38 come from controlled crossing. Of these 59 accessions, 21 belong to the system of Corpoica germplasm banks. The work collection represents a total of 1600 plants, from which 828 plants perform significant matches with the evaluated experimental population. The matched collection work were further classified into each accession, 6 palms were characterized with two or three repetitions per accession, based on 13 qualitative morphological descriptors including the form of reproduction (Table 1), to perform their function of evaluated materials in field conditions throughout regular visits. Source: Bastidas & Hurtado, (1993). The viability is greatly affected by quality of the observations resulting from plant structures and visual description. The color variable was measured with reference to the color chart proposed by Munsell plant tissue color charts. In addition, traits were encoded to convert them into numeric variables, in order to perform Multiple Correspondence Analysis (MCA). The modal characteristics in the 6 evaluated American oil palms. With the array of traits and accessions, we proceeded to stablish the MCA and construction of the genetic distances dendrogram with SAS 9.3 software(r). The morphological descriptors is frequently used to determine accessions of the work collection. 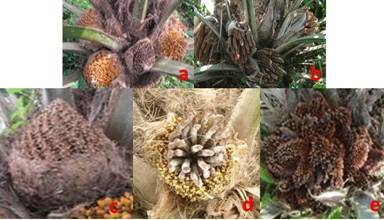 In full plant breeding program, Corpoica, typically produce palms which perform the following traits: immature fruit color status from yellow (2.5Y7/6) to mustard yellow (5Y7/10), and a small proportion of the collection (4.5%) perform green coloration (5GY4/6). (Table 1). In addition, 96.4% of fruit bunches, are considered orange-red of ripening fruit (10R4/10) and the remaining 3.6%, red color. 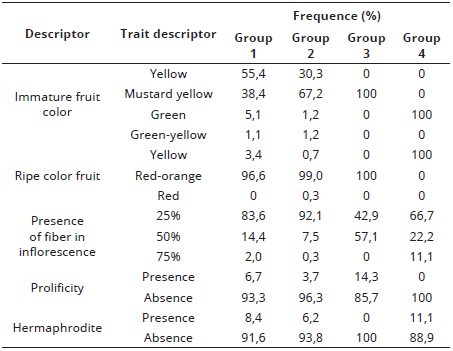 The amount of fiber in the fruit bunch which produces 25% of inflorescence exposure in 75% (Table 2). Table 2 Frequency table of 13 descriptors work collection for Nolí palm. In other words, the inflorescence at anthesis time, is not completely enclosed in the protective bracts, which is enough to facilitate cross-pollination, either by insects (Entomophilous pollination) or by wind action (Anemophilous pollination), the fruit bunch retains the bract vestiges until fruit ripening. Some palms of the E. oleifera species from Cereté series, had the ability to produce multiple inflorescences (Bastidas & Hurtado, 1993; Moreno & Romero, 2015). In this research, only 5.3% of the evaluated population perform this trait (Prolificacy). 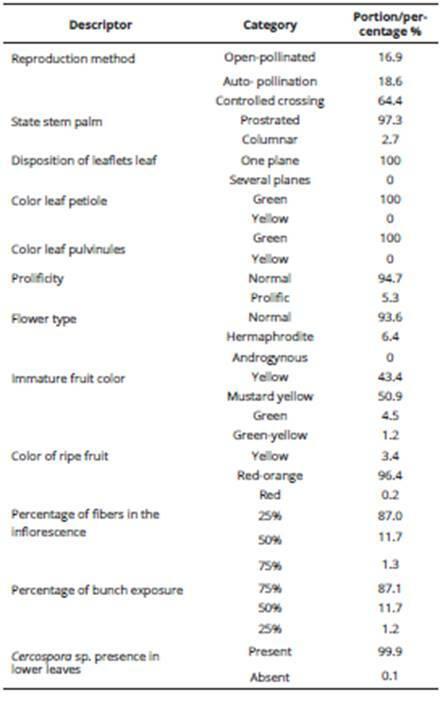 It is important to note that the type of inflorescences obtained in this research, only 6.4% of the hermaphrodite population inflorescences performed in 22% of the 59 accessions (Figure 1). Figure 1 Growth and emergence of the inflorescence. a). American oil palm in female cycle. b). American oil palm in male cycle. c). Normal inflorescence. d). Hermaphrodite inflorescence. e). Androgynous inflorescence. A quality highlight of the collection is the absence of palms with androgynous inflorescence (having male and female flowers in distinct parts of the same inflorescence). (Tables 1 and 2). Given these concerns, 86.6% of the plants had female inflorescence cycle (97.3%) and is generally considered to indicate the ability to perform a prostrate stem, normal phenomenon in this species. (Figure 2). In addition, the leaflets of E. oleifera species are regularly distributed along the rachis and inserted on a single plane, opposite to the insertion of the leaflets of the palms of the E. guineensis species, which are inserted at several planes (Corley & Tinker, 2003; Moreno & Romero, 2015). (Table 1, Figure 3). Petioles and leaves performed green pulvinules, which is an indicator of the low variability of the work collection, in these and other traits, while recognizing different states of green color, may indicate a nutritional deficiency. In the E. guineensis species, variations occur in these traits ranging from green to bright yellow (Corley & Tinker, 2003; Moreno & Romero, 2015), (Figures 4, 5). Finally, the presence of Cercospora sp. widely distributed in all palms collection, was only identified in lower leaves, those already fulfilled their mission to feed and sustain a fruit bunch, and were also close to the artificial pruning, which is established once or twice a year. (Figure 6). The MCA performed with 13 qualitative descriptors, indicates the 59 accessions of Nolí palm were classified into four groups according to the degree of expression of these traits. Therefore, the MCA shows little variability in the work collection of the Nolí palm and only 5 factors or correlations explain 100% of the variability according to the evaluated traits. The first correspondence contributes to 30.01% of the total collection variability. Alternatively, the second explains 28.71% of the variability collection, the third, 17.29%. The first three, provide the 76.01% of the total variability in the work collection (Table 3). Respectively, the low variability collection is explained in large part due to their genetic origin and geographical location, as palm progenitor of the collection which were selected in cross-pollination populations of spontaneous growth in field conditions at Valle del Sinú in influence areas of the municipality of Cerete- Cordoba, Colombia. Although, the seed reproduction system of Nolí palm where cross-pollination predominates (allogamy), and this provides more accurate and reliable estimates of small cross-pollination populations, can be assumed the occurrence of pollinations amongst related American oil palms (family) with common ancestors, generating populations with some degree of introgression of various traits. Presumably, 11 of the 59 characterized progeny were produced by auto-pollination and 10 are open-pollinated but with high probability of their seed production overcoming by crossing among neighboring palms with some degree of partnership. The dendrogram (Figure 7), represents the ranking of 59 accessions respect to other in relation to the thirteen (13) descriptors evaluated. (Table 1). 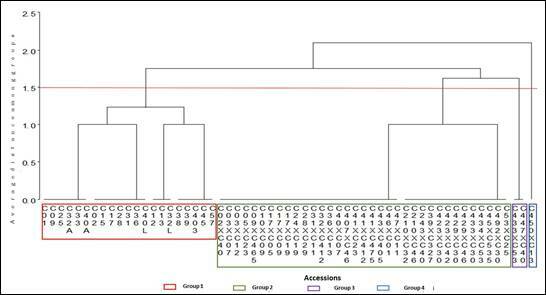 Figure 7 Dendrogram obtained based on 13 descriptors represented by qualitative characteristics of Nolí palm. Group 2: Consists of 35 accessions representing 59.3% of the American oil palm population. The palms of this group are characterized by the following traits: Those palms which were obtained by controlled crossing amongst other selected palms in cross-pollination populations. In immature fruit bunch stage, 67.3% of the American oil palm fruit bunches produce mustard yellow fruit, yellow fruit (30.3%), (1.2%) green, and yellow-green (1.2%). Of these fruit arrangement, though it is considered as a (99%) mature red-orange, yellow (0.7%) and (0.3%) red. (Figure 4). However, 7.6% of inflorescences, performed 50% coverage and 0.3% had 75% inflorescence coverage. Group 3: This group of two accessions obtained by controlled crossing were located. They represent 3.4% of the population. The two accessions are characterized by the following traits: unripening fruit bunches perform yellow mustard (100%) whose fruit ripening is red-orange color(100%). 57.1% of the American oil palms from these two accessions, had female inflorescences with more fiber around, covering 50% of the inflorescence, while the remaining 42.9% emit 25% fiber around the inflorescence, it allows 75% of the inflorescence (Table 4), had prolific trait and not performs hermaphrodite inflorescences, the rest, is identified as normal. (Figure 4). Group 4: This group represents one obtained accession by controlled crossing among selected palms in cross-pollination populations in full plant breeding program. The American oil palms of this accession, in unripening fruit stage, produce fruit bunches with green color (100%), which become yellow (100%) at total fruit ripening stage. In addition, the American oil palms of groups 1 and 2, emit low-fiber female inflorescences around, only covers 25% of the inflorescence, 11.1% had hermaphrodite inflorescences. (Figure 4). Morphological characterization of 59 accessions provides more accurate and reliable estimates of the American oil palm variability in the germplasm collection existing in El Mira Corpoica and its close relation among accessions in 4 cluster groups which were generated by affinity. Therefore, from 13 qualitative descriptors evaluated, five, had a high discriminant power: type of reproduction, color of unripening fruit bunch and color of ripening fruit bunch, envelopes percentage of fibers and exposure percentage of inflorescences. In the work collection of Nolí palm, easy observation descriptors were used and facilitate a more precise understanding of low phenotypic variability performed in the 59 evaluated accessions. Specifically, a characterization with quantitative production has become imperative due to the variability observed in the work collection of Nolí palm.